It’s tempting to break with journalistic tradition when writing a Boat Race preview for real rowers, and refuse to make a proper prediction. But in an apt game of two halves, as I write this looking west from Putney towards Fulham Football Ground on the morning of race day, I’m going to sit on the fence slightly for the men’s race but make an utterly unsurprising prediction about the women’s. The 72nd Women’s Boat Race, going off first on the racecard later today, must be Cambridge’s to lose, something which has rarely been said in the last 16 years during which they have won only four races. Oxford’s women are a decent crew, but Cambridge are superb, and it probably didn’t need the LIght Blues’ emphatic second place only four seconds behind Leander at the Women’s Head, to confirm it. More importantly, the Molesey crew which came fifth at the Head, 45 seconds slower than Cambridge, raced honours even with Oxford only a week later in two half-course pieces. Fixtures are not the Boat Race, and that was two weeks ago, but this is a powerful and experienced Cambridge crew who are a credit to women’s rowing. During starts on Friday at the Fulham Wall, Oxford’s women were fractionally higher rating in their wind-up and settled a little later than Cambridge, but the Light Blues were at least a second quicker to the end of the Star and Garter building, regardless of station – raising the prospect that the Dark Blues may have to use up some serious energy staying with them over the first couple of minutes. Oxford have shuffled their crew since the weigh-in, re-rigging from bow to stroke-side stroked to put Canadian international Emily Cameron in the hot seat. Much has been made of how Westminster School will have a winner in the Women’s Boat Race regardless of the result, since both coxes hail from there. They didn’t race each other at school – Ellie Shearer is a couple of years above Matthew Holland, and in fact only rowed at Westminster, starting proper coxing when she got to Oxford. Oxford have no returning Blues and their president Isa von Loga had to retire injured from trialling this year, while Cambridge sees four returners including Myriam Goudet and President Ashton Brown, who will be spurred on by the swamping which marred last year’s event, as well as former Olympic lightweight Claire Lambe. “For us this year there’s been a lot of rebuilding and a lot of new structures in place,” said their coach Ali Williams, “so it’s just trying to do what we can each day to bring the boat together. 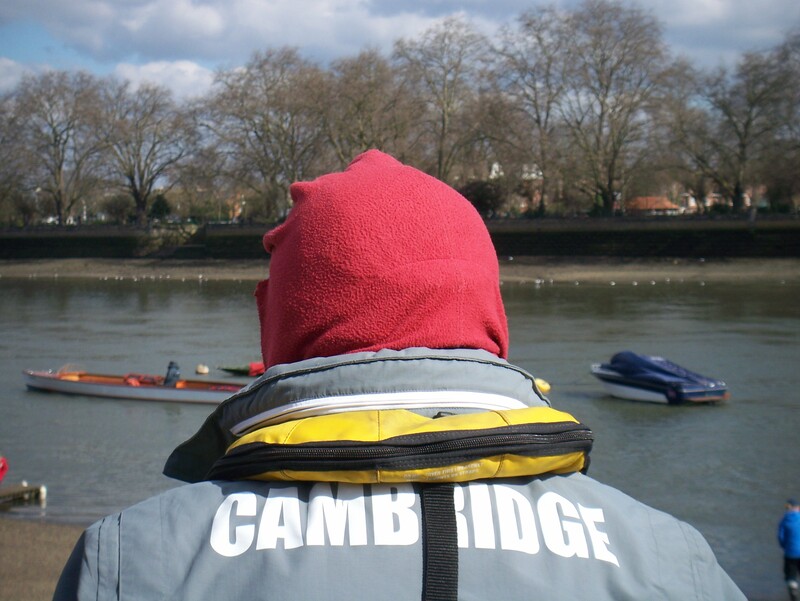 It’s just a matter of trying to do the best we can on the day and see what the result ends up being.” By contrast Cambridge coach Rob Baker has without a hint of bragging described his crew as the best that Cambridge has ever produced. Given that relatively calm conditions may lend themselves to a fast race, there is every chance the Light Blues, who covered the Women’s Eights Head in 18-17, could match that in the opposite direction today which would bring down the official fastest Tideway time for the women’s race to within two minutes of the men’s record. The outcome looks to be in Cambridge’s hands, but the chances are strong that her old university will win the first full Blues Boat Race umpired on the BBC by Sarah Winckless, making history as the first televised female umpire for the event. On the men’s side it’s much harder to be certain. Both crews have looked good all week, and there was little to choose between them during practice starts. Cambridge drop their blades in more delicately and build the power during the stroke, while Oxford have Sean Bowden’s trademark hook-and-sweep, a more definitive start to the stroke. Both techniques can work over a full course, and both look at home in the rather bumpy high-tide water their Boat Race will deliver, so race coxing and coolness under fire may matter more than normal. 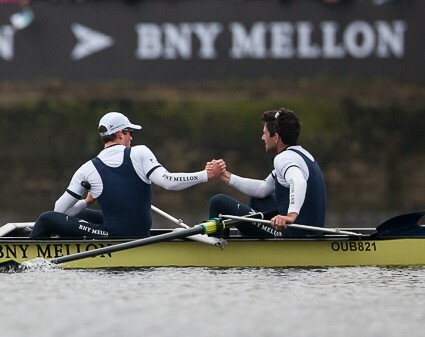 Betting is firmly on the side of the Oxford men, perhaps due to them managing to beat Brookes a month ago, while OBUBC got the better of Cambridge in January. It’s dubious how comparable that is, though – Boat Race crews accelerate in their preparation more than Head crews during the final two months, and when Cambridge are on form they are very fast. Knowledgeable punters may also be taking into account the fact that Sean Bowden has not lost two Boat Races in a row (neither at Oxford nor at Cambridge), and he is never more dangerous than when coming back from a defeat. In pedigree terms, Oxford have five returning blues and the two Olympians Olivier Siegelaar and Michael DiSanto, while Cambridge have only two returning Blues and no Olympians, but the slight advantage in weight and height. They also have the knowledge that three former Blues are now sitting in Goldie, meaning the newcomers will have earned their seats. For the likes of Freddie Davidson, the Light Blue 2-seat who at 18 is the youngest in the race, this is a serious vote of confidence. Michael DiSanto, Oxford’s President, benefits from not having rowed in last year’s losing crew – he was away training for the Olympics in the US national team. Of the 2016 loss to Cambridge he said “It’s not something we talk about too much – it’s a new crop of guys so we wouldn’t want to force that down the throat of the boat. We had to find what unifies nine of us this year.” “There’s a new sense of purpose for the race this year,” said his coach, Sean Bowden. The press have been excited by the prospect of a serious rivalry given that Oxford’s bowman Will Warr rowed for Cambridge two years ago. He will be only the third openweight man to have rowed in both side’s Blue Boats in the history of the race (there have been others in the women’s and lightweight crews), but the lack of communication with his old team-mates is more to do with focus on his own job than any real antipathy. However, for those who love patterns, his two predecessors both moved from losses with Cambridge and then won with their new university, Oxford. Back to the rowing, there is something about Oxford’s final few days of paddling which hints at hidden extra strengths, and suggests the smart money may not be wrong. But in the end this year’s men’s Boat Race, which could be close for many minutes, may well come down to which has the weakest, rather than the strongest, link. Oxford’s 11-length victory in the 160th Boat Race from Harrods Depository to Mortlake was executed in fine style and by the biggest margin since Cambridge’s 13 lengths in 1973. Barely one of those lengths was gained between the start of the four and a quarter mile course at Putney and the point where things went tips-up for the Light Blues. Cambridge, underdogs to a more powerful, more experienced and well-drilled Oxford, left the stakeboat in good and swift order and put their bows ahead. Oxford, who won the toss and chose the Surrey station, had taken the lead by a foot or two level with Thames RC, but at Barn Elms Cambridge were three seats ahead. Oxford came back swiftly, and at the mile post the crews could not be separated. Meanwhile, umpire Richard Phelps was busy with his flag from the off, warning each crew at least four times before the Black Buoy was reached and more after. There was little help or hindrance from either a sluggish tide or light wind, making the Surrey bend less of an advantage, and the question as Oxford made a push after the mile post was whether Cambridge had ignited too much fuel too early. It was then that the answer became irrelevant. Just after Oxford’s Laurence Harvey had responded to a warning by Phelps and moved his bow a shade toward Surrey, the blade of his No 7 man, the Kiwi Sam O’Connor, touched Luke Juckett’s in Cambridge No 2 seat as he was on the recovery. Juckett’s blade hit the catch on the feather, so to speak, and suddenly the hapless American’s back was arched over the side of the boat in a plume of spray, dragged by his crabbing oar. Given the surprise and the torture of the event, he made a quick recovery, helped by bow man Mike Thorp who grabbed Juckett’s oar handle and handed it back to him. The reporter next to me in the press launch had already written ‘Done and Dusted’ in her notebook and put her pen down. Juckett lost five or six strokes, Thorp lost a couple, and 3-man Ivo Dawkins’s rhythm was upset by the antics behind him. By the time all eight Light Blues were together again, Oxford had a couple of lengths of clear water, Harvey could go where he wished, and stroke Constantine Louloudis settled to a cracking demo of good rowing all the way to the line. The race reminded 31-year-old President and Canadian Olympian Malcolm Howard why he loved rowing. Luke Juckett’s dolphin impression may well go into Boat Race lore and language. But reflect on this. Fate could have dealt the Juckett to O’Connor and make his blade flip as a result of the touch of the tips. It’s a lesson in the virtue of trying to avoid touching blades in any circumstance. But on the day Oxford were, no question, worthy winners and fine exponents of the art of rowing. 2014 is the last year that Boat Race men will have the Tideway to themselves. Next year the Newton-sponsored women’s race joins the BNY Mellon guys on the Championship Course. The result of this year’s 69th women’s race at Henley of a 4 length win by Oxford over 2000 metres does not bode well for the transfer of the race to the Tideway. Rowing conditions at Henley were calm and near perfect. The margin translates into 12 to 15 lengths on the 4 ¼ miles of the Tideway. It should have left both clubs – certainly Cambridge, and certainly the sponsors — sucking their lips. It is, of course, too much to expect every P to M to be a nail-biter, as we have just seen. But the welcome to female Blues competing on the Tideway will be eased greatly if they can produce worthy encounters from the start. The world – including sponsors and the BBC – will be watching keenly for signs of the women’s race to become as gripping as the men’s has been of late. 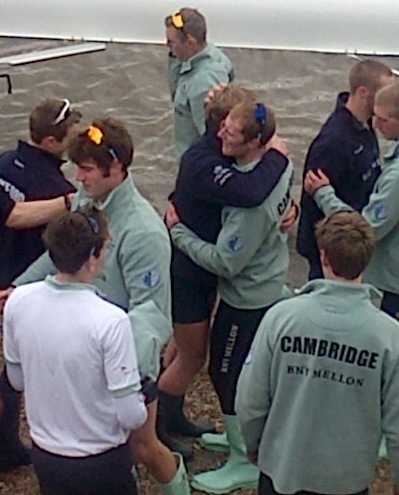 The Dark Blues’ reserves Isis made it a double act on Sunday, defeating Goldie by thirteen lengths in the Oxford understudies’ fourth victory running, despite a late change of stroke in the last few weeks when Tom Watson was swapped for Chris Fairweather in the Blue Boat. Umpired by Simon Harris, the reserves’ race saw Isis take a few seats lead as the two crews stormed down the Putney line of moored boats, and clear water by the Milepost, before they romped away to a commanding win despite Goldie’s best efforts. The combined margin for Oxford of 24 lengths is their biggest ever for two crews, given that it’s Oxford’s largest Blue Boat win since 1898 (verdict then given as ‘easily’) and the Isis-Goldie race has only been in existence since 1965. Isis beat Goldie by 13 lengths, unofficial winning time 18-39 (will be updated when official times available). When asked by a Canadian television crew at Putney why the Boat Race was such a big deal, I struggled with the usual clichés. There was no other popular sport when it started; Londoners took the Oxbridge toffs’ race to heart, and for reasons unknown the romance and the irrational support has grown into a worldwide TV audience; the Boat Race is two flies walking up a wall, easy to understand and easy to bet on; it quickly established a reputation for fairness. Then there are key aspects for sporting and rowing types. Pioneering amateur status rules, developing rules of racing; introducing eight-oared boats to the Championship Course from Putney to Mortlake already used for professional sculling races; extending rowing from a professional sport to an amateur one; the challenge of a long side-by-side race on a big river with a strong tide. For these reasons and more, the Boat Race retains its magic as the crews prepare for their 160th match. On the face of it, it remains a private affair for the Oxbridge intelligentsia, if no longer for toffs. But if you deconstruct Oxford and Cambridge 2014 into what brought them together, you find a variety of routes from the roots of rowing. The race that gives the sport of rowing – to say nothing of a couple of rare academic piles – an enormous publicity bonanza each year now contains traces and influences that stem from far beyond a bunch of college lads boarding a boat on the Isis or the Cam for a jaunt to London. The statistics of the 160th are as follows: Oxford have seven postgraduates, five internationals, four Blues, three Olympic medallists, three Canadians, three who rowed for Harvard, two Kiwis, two Brits and one American. Cambridge have seven postgraduates, four Americans, two Blues, two Brits, two who rowed for Wisconsin, one German and an Aussie. Both coxswains are British. The difference, you will see, is that Oxford’s higher pedigree on the world scene points to success on Sunday (but remember that when Matthew Pinsent returned from the Olympics to lead Oxford in the 1993 Boat Race, his crew bowed to a humbler Cambridge). It’s a victory for Oxford’s recruiting sergeant. ‘If this continues, we can’t compete,’ said an Old Light Blue this week. From inception to this side of the Second World War, Blues came from English private schools or learned their craft at the universities, with a trickle of American and Commonwealth oarsmen. The Boat Race bred internationals, while today it is as much a repository for internationals, even Olympic champions. Two-way traffic now involves North America as much as Britain, and there is almost annual input from European countries and Down Under. Its demography reflects changing patterns in higher education as well as the sport of rowing. It is also a heady mix of influences, personified in Malcolm Howard, Oxford’s 31-year-old president, who is studying clinical medicine at Oriel. Howard hails from the paradise of Victoria on Vancouver Island, learning to row at Brentwood School in British Columbia. He embarked on an incredible rowing journey when his studies took him to Harvard and the Charles River, going afloat under the legendary Harry Parker, 50 years coach of the Crimsons. He also found himself on Elk Lake, near his home town, where the legendary British coach Mike Spracklen was in charge of Canada’s heavyweight men. Now he is on the Tideway under Sean Bowden, coach to the Dark Blues who has built an outstanding record in the Boat Race. Three different programmes, three different legends. ‘Harry taught me how to race. Mike taught me how to train. Sean refined the way I row,’ Howard says. Parker’s programme encompassed multi-lane regattas like the Eastern Sprints and the Intercollegiate Rowing Association championships, the one-on-one 4-mile Harvard-Yale race, and trips to the English Henley. He put eight after eight of mixed ability on the Charles River and coaxed his men into sorting out for themselves how to race. Harry had a reputation for secrecy, a man of few words. But he was not secretive, Howard insists. He was a man you wanted to listen to, and you can guarantee anyone to whom he spoke would listen. ‘When Harvard bought the boat that we Canadians used to win the Olympics in Beijing and named it Michael Howard, Harry urged everyone at the naming ceremony to remember that there were seven others in the boat to win the medal,’ Howard says. Spracklen is a crew coach through and through. His strength is not in running squads or teams, but in looking after people who believe in him, who want to be coached by him. On his DVD on motivation, Spracklen says that everyone has a point where they back off, so his job is create an environment where the goal is to retard that point. One of his weapons is poetry. ‘It’s quite something to be quoted a poem before you go out to race at the Olympics,’ Howard says. Bowden began his coaching career at Thames RC and came to prominence with the now defunct Nottinghamshire County Rowing Association where he was responsible for more than 30 international medals. For several years NCRA coaches – Bowden and John Wilson with Harry Mahon – coached Cambridge and turned the Light Blues into winners. Howard stroked Bowden’s Dark Blue crew to victory in the 2013 race. Bowden is another coach that Howard has no wish to encounter as an opponent. ‘He is meticulous in every respect. Everything is thought through.’ Together with peaking on the day, attention to detail is a key for Boat Race coaches, given that their pool of talent is restricted to who is actually a full-time student at the university to which the club is attached. This exposé may serve to reiterate the Boat Race’s significant place in the sport of rowing, but it doesn’t add up to a certain Oxford victory. Cambridge weigh more and have plenty of clout even if they are lighter on international experience. But it’s what happens on the Tideway that counts. Richard Phelps is the man in charge of the 2014 Boat Race, umpiring the match for the first time. Phelps is a Cambridge Blue and a member of the famous family of watermen who competed professionally, holding the record for the most winners of Doggett’s Coat and Badge, builders of boats, boatmen to amateurs and earning their living on the Tideway. One of Richard’s ancesters was ‘Honest John’ Phelps, the finishing judge of the race until his reign ended with the dead heat of 1877. The race was close to Barnes, with Oxford establishing a small lead until the bow man’s oar fractured beneath the leather sleeve. Cambridge caught up lost ground and Phelps, in a skiff with his eye on the notional finish line – there was no post in those days, was unable to separate them. He later visited the chambers of the race umpire – himself on a steamer behind the crews – to announce the verdict of a dead heat. What happened after that was that ‘Honest John’ lost the job he had held for several years and was vilified by a series of accusations of being drunk, lying in bushes and unfit for purpose. Maurice Phelps has done much to clear his ancestor’s name in his book The Phelps Dynasty, and now Tim Koch of the blog Hear The Boat Sing has made a documentary which sets out to complete the job. ‘Oxford won, Cambridge too, the 1877 Boat Race and the vilification of John Phelps, a continuing injustice’ looks at all the available evidence and produces irrefutable arguments that, far from being legless and blind at 8.30 on the morning of 24 March 1877, Honest John was a sober, cultured and moral waterman, and that his verdict was, near as dammit, correct. Signs of the times in Henley: the recession has arrived on the town side of the river, with at least six shops boarded up within spitting distance of the Town Hall. Inflation has hit the regatta side, with Pimm’s at 10 quid a pint in the champagne bar, I hear. 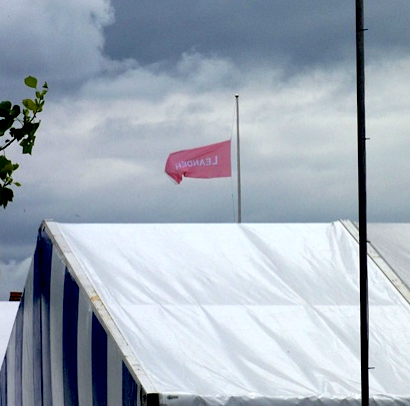 Flag at half mast at Leander Club to honour Harry Parker, Harvard’s coach of 50 years, who passed away last week. Gloriana moored outside the boat tent, the most gorgeous lady in town. Ran into Walter Hoover, son of the Walter Hoover who beat Jack Beresford Jr in the Diamonds in 1922 in a boat he designed himself. Crews from all over the country and many parts of the world and thousands of people without cares in the world, or so it seemed on a crowded first day of Henley. As the racing programme sorted 80 winners from 80 losers, it got me thinking about elitism, protest and rights. The Aussie with two surnames, Trenton Oldfield, has found that the water he jumped into on Boat Race day 2012 is hotter than he first thought. The Home Office rejected his application for a spousal visa, declaring his presence in Britain ‘not conducive to the public good’. After living in the UK for 12 years he will be deported back to Australia, barring a successful appeal. His British wife Naik gave birth to their first child a few days later. Ahem. From where I was sitting in the press launch, I didn’t notice that Oldfield was wearing rose-tinted goggles. I would say that he slightly misjudged the tone of the reception he received. I think a great deal of restraint was shown, especially on the umpire’s catamaran when the privately educated ex-rower from Sydney was yanked aboard. The smile on his face was not reciprecated. The water began to boil for Oldfield later when the police upgraded his charge from a public order offence to public nuisance, an arcane common law carrying a maximum sentence of life. ‘That’s when we began to worry,’ said Trenton’s wife Naik. The Home Secretary may decide that the six-month prison sentence, of which Oldfield served two in Wormwood Scrubs and has turned his experience into a book, was punishment enough for seditious disruption of a boat race. It’s hard to find sympathy for such an ill-thought out protest or such a crass life-endangering act. But the issue of deportation certainly has a nasty taste on top of the question of what’s the point of time-serving in the Scrubs on the public purse. I find myself in agreement with Tobias Garnett, who wrote in the Guardian that, as someone who had rowed in the Boat Race before 2012, his main reaction was of anger at this act of sabotage, which cruelly robbed both crews of a fair resolution to this increasingly tight race and to their months of training. But, he went on, ‘if the sabotage of the race was what I felt most viscerally, for Oldfield that was mere collateral. His real intention [having settled on elitism as his target] was to spark a debate.’ The Home Office’s decision to reject Oldfield’s application for a spousal visa leaves Garnett thinking his actions were indefensible, yet wanting to take him up on the invitation and defend him as he is swept into a much larger debate about the politicisation of legal sanctions. If this was football, Steve Trapmore would be walking the plank by now. His record is now two losses to one win, and there have been times in the past, both post and ante the exceptional Robin Williams, where Coach on the Cam falls foul of an insecure hierarchy. The nature of the event plays to uncertainty. Only one fixture matters and there are no places other than first. As one of the most enduring players once put it to me, in the Boat Race there are only styles – winning and losing. At least one thing is different from the football sin bins, however. After Trapmore’s crew had just been defeated in the 159th match with Oxford, the man himself walked along the beach at the finish and shook opposite number Sean Bowden by the hand. And Sean shook it. No Ice Cold Alex, him. It may look bleak for Cambridge right now – Oxford are creeping nearer to squaring the score, which now stands at 77 Dark wins to 81 Light – but before the Light Blue heavies start re-reading his soon-to-expire contract, let’s have a look at Trapmore’s third. It is too early to man the panic stations. For this was a great race, the sort of race you hope for and sort of race that last year’s might have been but for unusual circumstances. Fourteen minutes of side-by-side passed before clear water was visible between the boats. Oxford chose Surrey but tried to row on Middlesex for much of the way, or so it seemed to me from the launch nearest to the Surrey bank. After a tolerably good start – “I thought our start was OK,” said Sean, “Fortunately our bad ones are still OK, and I thought it was one of those” – Oxford were warned twice by umpire Pinsent before they reached Newens Marine’s premises, but had squeezed to about four seats up at the Black Buoy (still painted yellow, by the way). Soon after that Sir Matt was warning both, and then Cambridge, and there was clashing. Zorrilla was quicker to respond than Fieldman, he said. The flag man at the Mile Post would have us believe that the crews were level, because he only lowered his flag once, but Oxford were in the lead there by at least a couple of seats. From my perch the crews still looked far to Middlesex and, approaching Harrods, Cambridge were warned twice, and were clocked two seconds slower than the Dark Blues to Hammersmith Bridge. By now, with both crews rhythmic and rating about 33 all the way from the third minute, Oxford had failed to capitalise on their lead. There would be no rocketing booster to open the gap, despite an attempt as they shot the bridge. They were not more than three-quarters of a length up passing Latymer School, where the Cambridge cox Henry Fieldman learned his trade, and the Light Blues held the outside of that long bend all the way to Chiswick Steps, where the margin equalled the two seconds at Hammersmith. After the Steps comes the Crossing, where the river bends left but the Tideway veers off the Surrey flats towards the Middlesex station. Land water was probably applying the brake by now, and Oxford at last opened clear water while facing the outside of the last bend. Coxswain Oskar Zorrilla faced a make-or-break calculation. Would taking Cambridge’s water make or break his crew? Cambridge could not produce the surge, but Fieldman cleverly manoevered them just off centre of Oxford’s stern to minimalise being washed down by the Dark Blues’ stern. And the pressure never let up. They shot Barnes Bridge five seconds behind, and still with the bend in their favour, stepped on the gas again, while Zorrilla sidled toward Surrey to put his boat beyond territorial danger. The gap at the finish was four seconds, or a length and a third. A length and a third or about 80 feet is not a lot of difference after four and a quarter miles of rhythm and Blues. The 159th is the latest example of a Boat Race that goes the distance, and Pinsent, umpiring his first Boat race, was highly chuffed that both crews were given an equal chance to display what they are capable of. It was packed with the action we like to see, not the action of misplaced protest, and that should please BNY Mellon in their first year of sponsorship. Bowden praised Cambridge’s sharp start and dangerous pursuit. The late, great Acer Nethercott was honoured with his name on Oxford’s boat. Zorrilla was thrown in the drink. And it is too soon for Trapmore to walk the plank. He did as good a job as Bowden in melding a boat-load of oarsmen from Melbourne (Oz) to Litomerice (Czech Rep), or in Sean’s case from Christchurch NZ to Bozeman, Montana, and everywhere in between. Though I pity whoever’s lot it was to make the speech at the Cambridge dinner on Sunday night. There was a ding-dong reserves’ race where the lead changed a couple of times and Isis emerged narrow victors by a third of a length. So the day added two Dark Blue victories to the four gained a week before at Dorney, where the women and their reserves and the lightweight men and women won, giving Oxford a clean sweep. The happiest man on the bank was Neil Chugani who was Oxford’s dinner toaster. He had prepared one for each possible outcome. How nice to be able to scatter the agony one to the winds. That’s metaphorical, by the way. The promised east wind was not a factor in Oxford’s day. An hour after the race, when the needle for the 160th Battle of the Blues began, the tide turned under fading light at Mortlake, and flotsam resembling a body bag floated past the press centre, bound for Gravesend. Reporters stood to bid farewell to Trenton Oldfield. The chief sport at Putney these past days leading to the 159th Boat race has been looking out for parked cars likely to be swallowed by vigorous high tides. But inevitably after the high jinks of last year, the unmentionable cur who made the 158th race one of two halves has hogged the headlines and the copy, if not quite the limelight. He has been braying to the Spectator that he is a sought-after consultant to the Met in their desire “to facilitate any peaceful protest” and to afford him his “lawful rights without causing disruption or danger to himself or others” – surely a cunning ploy by the cops to get the cur to leave his wet suit at home and tag himself. It appears to have worked if you can believe his statement to the magazine that he intends to go rambling in the Cotswolds this weekend. Incidentally, several Spectator respondents to the latest news of the Aussie class warrior wonder why he is permitted to remain in the country. Last year was not just the near beheading of an idiot. The re-start was soon followed by a clash in which, umpires are agreed, Oxford were at fault, only to be punished by breaking a blade and losing the race. The inevitable delay in re-starting is reckoned as a factor in the collapse of Alex Woods, the former lightweight in Oxford’s bow seat, into unconsciousness (Alex is happily appearing this year in the Isis crew). My suspicion is that there is nothing new in armed marines floating about on Boat Race Day. But the race organisers have rightly reviewed safety and emergency procedures. They have set clearer guidelines for who should do what in the unlikely event of a stoppage. 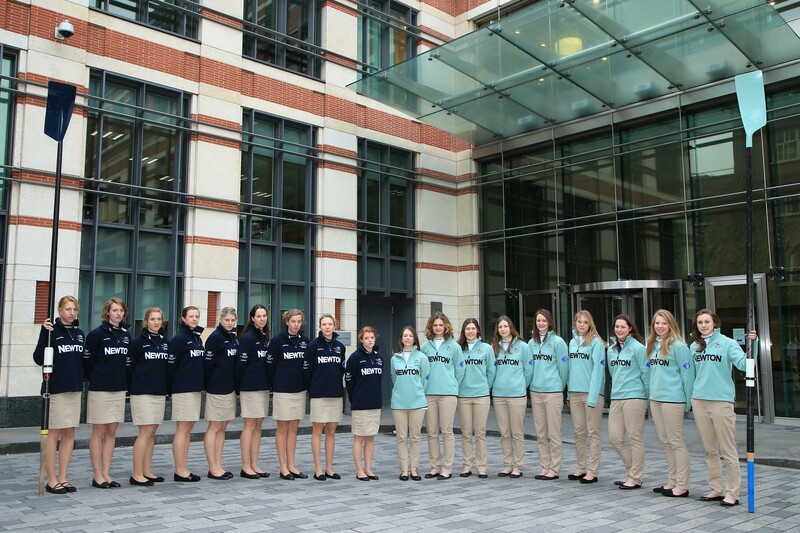 And so to the recipe for the elite – in the best possible sense – for the 159th Boat Race. Ingredients – sixteen good men and true, plus two coxswains. Active brain to admit candidate to study at university of choice. University fees or horrendous loan. Physical fitness and mental agility. Professional high-calibre coaches. Ability to pull an oar and move a boat. Funding for boat club, now from BNY Mellon. Stamina to get to the end of the Fulham Wall to earn that Blue blazer that you have to pay for yourself. Hazards – ire of the umpire, who may be God but is powerless in the face of obtuse coxes. Wind from the side. Wind from ahead. Wind from behind. Eddies, whirlpools and waves. Strong tide, weak tide, heavy land water. Snow, sleet, vertical and horizontal rain. The other boat (which looks good on paper and swift on water, guys, belive it). Driftwood, swimmers, armed marines, PLA launches. This week the crews have been paddling about, practising starts and preening themselves, posing for team photos while hoping to peak on the day. They sent their presidents, coxes and coaches to press conferences at which questions about unexpected occurrences and sore points were fended. Dark Blue coach Sean Bowden was asked if revenge was a motive this year. Who do we take vengeance on, he asked in reply. His president, Alex Davidson, said it may be irksome to have lost last year, but the important thing is winning this year. Oxford had five returning Blues of whom three made it into the boat, including the London 2012 bronze medallist Constantine Louloudis, who also stands out because he is the only Etonian afloat this year. His stroke is Malcolm Howard, Canadian silver medallist at London 2012 who was coached by Mike Spracklen who brought success to Oxford after the mutiny of 1987. They are using a boat christened Acer Nethercott in memory of their illustrious cox who died recently of brain cancer. Cambridge coach Steve Trapmore said that this is his best crew and squad since he has been on the Cam, which is three years. Bowden’s been around too long to be besting, having won eight with Oxford and two with Cambridge in a previous life from 17 starts. Light Blue president George Nash, also a London 2012 bronze medallist, is the only Brit on board apart from his cox, Henry Fielding, who learned the Tideway from Latymer. Between them the crews have six nationalities, including Cambridge’s Milan Bruncvik as the first Boat Race Czech (apart from Bob Janousek who coached them for a year, yonks ago). If Cambridge win, one factor could be their new secret weapon. The railway beside the bleak Ouse at Ely has been electrified, providing stanchions at regular intervals as speed- and timing-ometers and the opportunity to out-pace trains. But like James Cracknell in the Telegraph, my instinct tells me that Oxford will win on Sunday. Then again, tell that to the marines. The men’s 2013 Blue Boats square up to each other on the Tideway shoals at Putney. My text is taken from the financial market prospects for 2013 and beyond as seen by Newton, the global thematic investing company that is part of Bank of New York Mellon, sponsors of the women’s and men’s boat races respectively. If the analysts at Newton didn’t get the wisdom of past performance being no guide to future performance from the University Boat Race, then they might just as well have done. The men have been testing the maxim since 1829, and being active and flexible to peak on the day is an ingredient of a day in the office for Boat Race coaches, whether they are preparing crews to battle from Putney to Mortlake or belt down Henley Reach. Such thoughts occurred at Monday’s weigh-in for the crews for the women’s race on March 24 at Henley and the men’s on March 31 at Putney. It was historic because the it was the first occasion that the men’s and women’s crews had weighed in together, the first move in the transfer of the women’s race to Boat Race Day on the Tideway in two years’ time. The proceedings in the comfort of the Blackfriars HQ of Mellon and Newton began with the obligatory deep throated sound track under scenes of Boat race grunt and grind – ‘Time for the talking to stop! Time for the heart to start ticking! When eight become one! Human synergy in perfect motion! For this one moment, the time has come! It was good to note that some of the footage belonged to Acer Nethercott’s crews, the philosopher, physicist and cox who steered Oxford to victory in both the men’s and women’s races in the course of his career, and who died of brain cancer this year at all too young an age. When the fanfare and screen malarkey died down, there was Sir Matt Pinsent, umpire of the men’s race, to master the ceremonies in the chair. The crews sat facing each other, men on bar stools and women on chairs in front, as Matt called them up to the scales by seat. Pounds were translated to stones, pounds and ounces on screens – so much more clinical than the old days when an old heavy would take the readings and laboriously do the conversion while everyone waited with baited breath while harbouring their own opinion about the maths. Matt didn’t have to do any sums, but he fell over himself a couple of times in the excitement of compering the first joint weigh-in by inadvertently inserting a ‘W’ when referring to OUBC and CUBC. For the record, Cambridge’s women are heavier, averaging (excluding coxes) 11st 10oz to Oxford’s 10st 6lb 13oz; while the Oxford men are 14st 12lb 12oz to Cambridge’s 14st 6lb 14oz. There was a welcome absence of going for a record by drinking litres of water beforehand and rushing for the loos afterwards. Statistically heavier crews win more races, but don’t put money on it. On grooming and sartorial matters, short hair is clearly in for men and long for women. They would all look great on the catwalk if they didn’t have to wear predictable shades of blue Lycra. Helena Morrisey, Newton’s chief executive, took the chic prize for a dark blue cardi worn over an elegant light blue print dress. The Oxford women wore their hair up as if ready to step into the boat. The Cambridge women wore theirs down. This was not just to distinguish them from the enemy, but also to flaunt their locks over the left breast to cover up the accidental CUBC logo on their lovely Hackett tops. Where Matt kept inserting the W, Hackett unfortunately lost it. The coaches, Christine Wilson (OUWBC), Rob Baker (CUWBC), Sean Bowden (OUBC) and Steve Trapmore (CUBC), predictably expressed their joy at the support of their sponsors and the preparedness of their crews. Once off the stage, Bowden admitted that the old tradition of clashing in side-by-side pieces with London University had been revived, and that Oxford may have bitten off more than they can chew when a German composite of current or ex-internationals turns up to race them on March 17. With five men still in line for the GB four and five more for the quad, we look at the questions that still remain over GB’s London line-ups, ask whether Britain can remain the top Olympic rowing nation and look at selection elsewhere. We discuss whether the Boat Race has become a retirement home for former internationals or is still the nursery for future Olympians. And how, two weeks ago, the women’s event showed how much work the clubs still have to do before their Tideway move in 2015. Coach Alex Henshilwood explains why he sees the finish as the foundation of the rowing stroke and a sports osteopath looks at how to avoid pain in the patella. Truly it can be said that the 158th Boat Race was a race of two halves. All predictions were off. The first ten minutes was probably the closest Boat Race we’ve seen since 1829, but ended in a dead-heat farce when a suicidal swimmer in a wet suit dived below the surface to avoid Oxford’s blades, was picked up by the Umpire’s launch, and cuffed when the police got to him. The second half started alongside Chiswick Eyot half an hour after the incident with the crews level. Chiswick Steps were passed 35 seconds later, Garrett raised his flag and warned Oxford, there was a clash, Oxford’s No 6, Hanno Wienhausen, found himself rowing without a spoon on his loom, and frig-rigged Cambridge romped away. Dark Blue cox Zoe de Toledo tried her own semaphore at Garrett, to no avail. The Light Blues had three lengths at Barnes Bridge and were thirteen seconds ahead at the finish. De Toledo raised her hand under Chiswick Bridge, and Garrett explained that because crews are responsible for their own mishaps, Oxford were being warned at the time of clash and Cambridge were in their rights on the river, the appeal was turned down. That was not the end of the drama, either. Oxford’s bow man Alex Woods collapsed in the boat, was transferred to the Oxford launch Bosporos and eventually taken to Charing Cross Hospital where his condition was described as stable. His heart may have stopped but he was conscious when eventually transferred to an ambulance from Bosporos. And so, back to the beginning. Many pundits had expected the lighter Oxford crew, artists of the clean quick start, to streak off and stretch away to close the door in the opening minutes. Instead they found Cambridge, toss winners on the Surrey station, hanging on and looking strong. It was hard to judge from Majestic, the press launch on the Surrey station, but the most that Oxford went ahead was about two seats at the yellow buoy (known as the black buoy). At Barn Elms the crews were level — and close together, which caused umpire John Garrett to exercise a lot of semaphore, much of it directed at both coxes simultaneously. Oxford went ahead again by a shade before the Mile but were fractionally apart as the flag dropped. At Hammersmith Bridge there was nothing between them, either going into the bridge or, remarkably, coming out of it when Cambridge’s Ed Bosson ensured that he kept Toledo over to Middlesex. Mind, Bosson got some flag from Garrett before the bridge. Approaching St Paul’s slipway Cambridge were up by three or four seats but at the blue window of the late Julian Trevelyan’s studio — roughly half way — the Cambridge advantage was again under threat. Here, along the long Middlesex bend, was where the Light Blues were supposed to excel, to bring their mighty engine into play and wear down the darker lightweights (comparatively speaking, that is). But no. Rather, despite the Cambridge running and how, Oxford kept on going, and with the crews level at Chiswick Steps, we were all set for a duel at the Crossing and a belter round Duke’s Meadows where Oxford would regain the bend advantage. Alas, it wasn’t to be. The race was stopped by a swimmer, a swimmer with, it seems, evil intent. Assistant umpire Sir Matt Pinsent, on the umpire’s launch, spotted him first. Garrett could do nothing but stop the race while the chasing flottila slammed into reverse and rode out the swell. The umpire launch driver Jamie Turner grabbed the wet suit and with one heaving stroke landed it on the deck, complained that the amphibian had caused Jamie’s chinos to get wet, and attributed a female part of the anatomy to him which even Rowing Voice has not the temerity to utter. ‘I found it very British,’ Pinsent said at a press conference later, ‘the way a swimmer swam out and stopped a great sporting occasion and we were responsible for rescuing him.’ The culprit was transferred to an RNLI boat and then to a police launch. Half an hour later, the crews returned to the foot of Chiswick Eyot where Garrett judged they could be started alongside each other in a part of the river where neither was dis-advantaged. There was not much water between them. Oxford again began quicker and showed a little in front when after about 40 seconds there was a mighty melée. Wienhausen lost the end of his blade and Oxford were effectively down to seven men, though he rowed along with his handle and loom in good rhythm. Cambridge surged ahead. It must have been thrilling for Bosson, who according to the Guinness Books of Records holds the one for wake-boarding across the Channel (2 hours 12 minutes). Oxford made a good fist of it from Chiswick to the finish, but it was a forlorn hope. To have their appeal turned down and their bow man Woods pass out marked the end of a bad day at the office. I daresay that Cambridge have mixed emotions as well, despite bringing their total in the series to 81 against Oxford’s 76, not forgetting the dead heat. Cambridge men paid tribute to Alex as well. The trophy was not presented at the end of the race, so it was also a bad day for prize-presenter Mayor Boris Johnston (one theory is that the swimmer was Ken Livingstone). Incidentally, a hundred years ago was almost as eventful. Cambridge sank off Harrods and Oxford beached to empty their boat opposite the Dove. The race was re-run on the following Monday, this time with an Oxford victory. Bow: Dr Alex Woods (Pembroke), William Zeng (Oriel), Kevin Blaum (Trinity), Alex Davidson (Christ Church), Karl Hudspith (St. Peter’s), Dr Hanno Wienhausen (Christ Church), Dan Harvey (Mansfield), stroke Roel Haen (Oriel), cox Zoe de Toledo (St. Catherine’s). Bow: David Nelson (Hughes Hall), Moritz Schramm (Fitzwilliam), Jack Lindeman (Hughes Hall), Alex Ross (Caius), Mike Thorp (Homerton), Steve Dudek (St. Edmund’s), Alexander Scharp (St. Edmund’s), stroke Niles Garrratt (Hughes Hall), cox Ed Bosson (Pembroke).